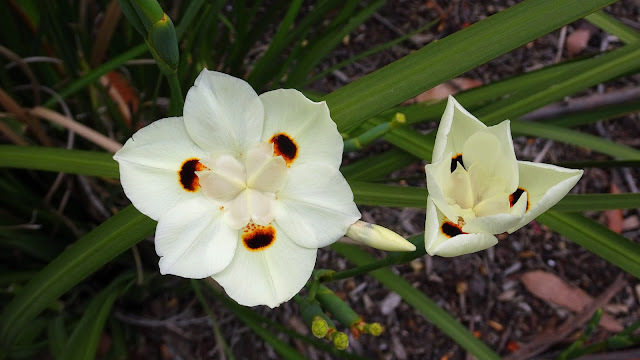 Dietes bicolor (variously known as African iris or fortnight lily) is a clump-forming rhizomatous perennial plant with long sword-like pale-green leaves, growing from multiple fans at the base of the clump. This species belongs to the Iridaceae (Iris) family. It can form large clumps if left undisturbed for years. This species is common in horticulture in its native South Africa, where it is often used in public gardens, beautification of commercial premises and along roadsides. The blooms are yellow with three dark purple spots, each surrounded by an orange outline, and are followed by a capsule that may bend the flower stalks to the ground. Ripe seeds (dark brown in colour) are dispersed when the capsule dries and splits. The leaves of Dietes bicolor are narrower than those of Dietes grandiflora and Dietes iridioides, and tend to arch more. Some species of Dietes are considered "environmental weeds" in parts of Australia, particularly Western Australia, Queensland, and Lord Howe Island. I'm guessing that environmental weeds are what we call invasive species.